Pain treatment is now considered to be the most demanding health epidemic in the United States, surpassing heart disease, cancer and other medical problems. Even the U.S. government has declared the opioid crisis a national public health emergency (without additional funding for it). Medical science continues to investigate alternatives to narcotics but still focuses on the belief that pain can be medicated away. A natural human reaction to experiencing emotional or physical pain is the desire to get rid of suffering: repress it, bury it or pretend it doesn’t exist. As therapists, we work with a vast array of people vulnerable to the abuse of drugs, alcohol or food in their attempts to regulate distress. Long-term efforts in pain treatment have sought to eradicate pain as if it were a single conquerable disease, rather than the multi-faceted complexity that more recent research has revealed. Yet insurance companies continue to cut their coverage of physical therapy, massage therapy, acupuncture and other non-drug modalities. Perhaps part of the reason why extensive research has not been able to demonstrate efficacy in the area of pain and addiction is because neither research nor treatments have pinpointed the root causes of these disorders. Some of our clients may have terrible, persistent pain and poor responses to therapy as well as to medical treatment. But at last the role of childhood trauma in “driving” pain and addiction is gaining increasing scientific traction, linking various types of trauma to the underlying causes of pain and addiction. Conditions including fibromyalgia, myofascial pain, cancer pain, osteoarthritis and complex regional pain require leveraging the latest research and innovative strategies to regulate and resolve chronic suffering. Learn how neuroscience is now clarifying the role of attachment in pain as part of my November webinar. A crucial missing factor essential to long-term healing is addressing the unresolved emotional trauma held within the body. Neuroscience has clarified that attachment early in life does program the brain and body for the environment it encounters. Calm, nurturing environments will orient a child to thrive, while stressful, chaotic surroundings predispose it to conditions of anxiety. If someone has experienced trauma prior to their current injury or condition, old memories can potentially be triggered, exacerbating the effects of newer trauma. Conditions that don’t resolve with conventional medications and therapies require practical strategies, such as how to choose, introduce and pace appropriate interventions. Don’t miss “Treating Complex Pain Syndromes: The Art and the Sciences” with Peter Levine: Click Here for more information and registration. Our work needs to balance appropriate medication at doses to help regulate pain and trauma symptoms while the individual learns skills to maintain autonomic balance. In other words, we advocate the judicious use of medication in a program that emphasizes skills rather than pills. Learning and practicing simple skills to help resolve underlying trauma has the potential to make a real difference. It is not enough for clients to accept they have a problem, and then to identify possible solutions. It is also necessary to recognize and express emotions that may have presented in the body as an aspect of the physical pain problem. We need to work with them to motivate and reward pathways in the brain, along with new pathways of thought, behavior, emotion and sensation. A simple explanation of how inner emotional tension/stress creates physical pain is to remember that all thoughts and emotions are energy. An emotion or feeling is being denied or avoided; repression causes it to become blocked or stored energy in our bodies. Intense conflict erupts in our body/mind. Blood flow can become chronically constricted, depriving our tissues of oxygen and creating other problems. The tension from this inner conflict will eventually be experienced as pain. If our intention is to heal, we can do this by keeping our energy and emotions flowing freely. We can communicate within and about our body and mind systems in a balanced, open, efficient way. When our system is open and free, we have linked our psyche (thought, emotion and spirit) to our physical bodies (molecules, cells and tissue) in a free flowing exchange. The content of the experience is unimportant. What does matter is that in this moment, the entire being is engaged and feeling connection and wholeness. If a client can find a moment where there is a feeling of flow rather than constriction, you can work with them to use breathing or imagery to make the connection stronger and more real. Not only is it important to generate as many of these moments as possible, it is also essential to reinforce their importance by recalling and reflecting on their essence. Such moments can become a bridge to a more pain-free life. 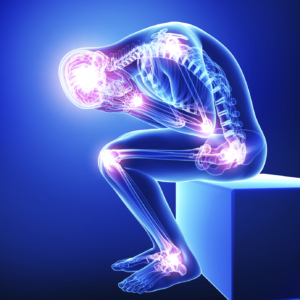 There is no magic pill to treat Complex Pain Syndromes. Rather, a combination of advances in neuroscience, strategies for pain management and working with the totality of experience can create a healing relationship. Collaboration with medical professionals who understand our approach can offer our clients a new chance at freedom from pain resistant to conventional treatment. Given the magnitude of the pain treatment crisis in this country, we as therapists have much to offer in the way of solutions. Discover more about innovative treatment for Complex Pain Syndromes on Thursday, November 16: Click Here for more information and registration.